Boro Park - Cops arrested a man they say brazenly broke into a Brooklyn home to steal a menorah made of pure silver worth $10,000. Denis Ildatov, 25, was busted Monday and charged with burglary and possession of stolen property for the heist of the religious antique about 10:30 p.m. on Aug. 21, police said. 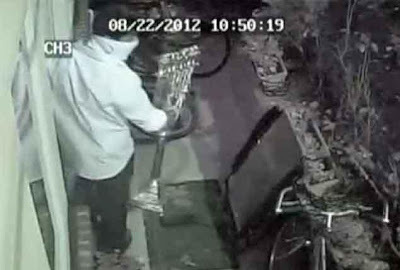 The NYPD released of video last week of the suspect entering a house on E. Fifth St. in Midwood from the back door to sneak in and take the costly religious item. He was dressed in black slacks, a white shirt, black dress shoes and was wearing a yarmulke, cops said. The menorah, a family heirloom, was recovered by cops, the family said. Yael Zion, 43, said she was home sleeping when cops say Ildatov entered her home. Her children were awake upstairs at the time, she said. No one in the family noticed because the burglar stayed on the first floor, going to the living room where the menorah was on display, according to Zion.